Click Here To See Full Sheet Of 36 Original Art Marvel Stamps! This spectacular illustration was drawn (attributed) to Marie Severin, produced in early 1964 and pre-dated the very first Marvel Silver Age Stamp set. This small drawing was 1 of 36 illustrations originally produced on a single sheet of paper, cut out and professionally matted and framed under glass. (See reference image in red link above) The 36 image sheet had a date of 1/9/64 written in pencil on the back. 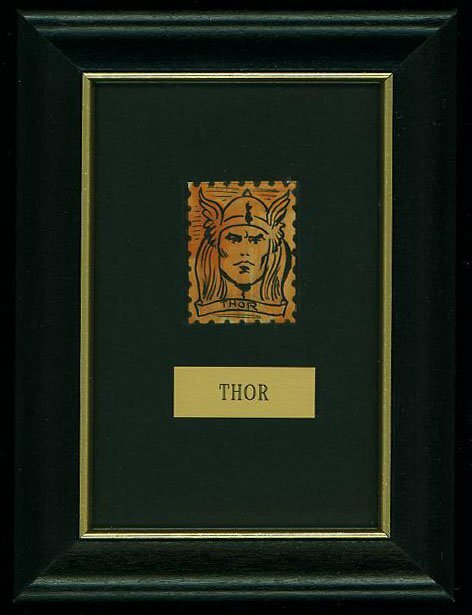 This stamp depicts a very early image of The Mighty THOR. To the best of our knowledge, the stamps have been attributed to Marie Severin, who was known for taking on projects like this back in 1964 at Marvel. 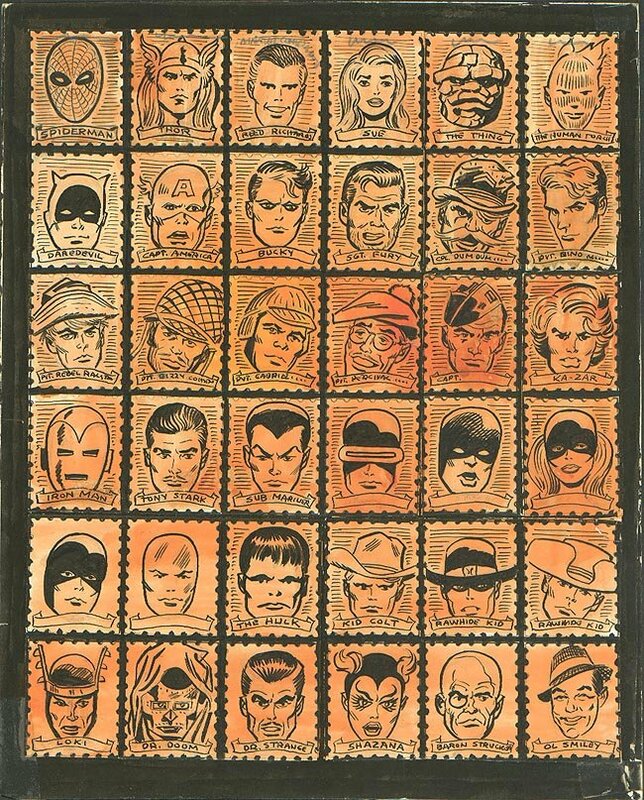 The stamps depicted the main Marvel characters of the day and some that were in development at the time (there was a Stan Lee stamp labeled: Ol' Smiley – lower right). Executed in pencil & ink on paper with an actual art image measuring 1.25 by 1.5 inches. The work is professionally matted and framed with a unique brass name plaque with an overall size of 4.75 by 6.2 inches. ALL art on our website (including this one) are able to be purchased with VERY fair time payments, and trades are always considered towards "ANY" art on our website! Just send us an email to mikeburkey@aol.com and we can try to work something out.